Kong Liang is first mentioned in Chapter 32 of the Chinese version of the story of the marsh bandits. Squire Kong is the lord of a place called White Tiger Mountain where he has a manor. "The young fellow you fought is his youngest son. Because he's hot-tempered and belligerent he's known as Kong Liang the Flaming Star. The one in the gosling yellow tunic is the squire's eldest son. His name is Kong Ming, and he's called the Comet. 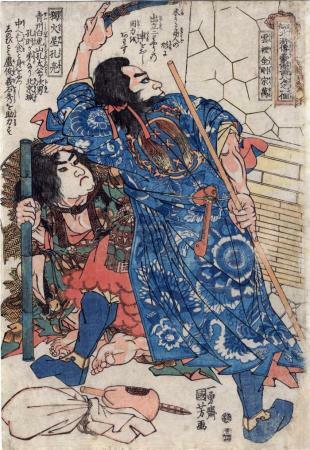 Both are fond of spears and staves..."
Chapter 32 starts off dramatically with Wu Song beheading an attacking priest whose "...head went rolling off to one side..." as his body slumped to the floor. To say that Wu Song was obstreperous is an understatement. There was a frightened girl who saw all this take place. Wu Song found out from her that the priest had about two hundred ounces of silver and gold. He told the girl to gather it up and bring it to him. Then he set fire to the priest's temple. Wu Song travelled for he next few days disguised as a monk. Every village he went through has wanted posters calling for his arrest. Eventually he reached a simple tavern by a stream. While there he called for wine and food. The owner told him that all they had was a cheap house wine and were out of meat to feed him. "Bring the wine, then. It will ward off the cold." The host brought him the wine which Wu Song soon finished off calling for more. He was also brought some vegetables to go with them. When Wu Song demanded more and better wine the host said that that was all they had. Then a young lord and his companions came into the tavern and were greeted by the owner warmly. A short while later they were served chicken and meat and a fragrant "flowery-jug wine". This infuriated Wu Song who demanded to know why these things had been kept from him, but served to these new visitors. The host tried to explain that the wine and food were already the property of the visitors and were simply left there for their arrival. "Wu Song's craving blinded him to reason. "Farts, farts!" he bawled. "You're a stinking liar!" [The host said:] "I never saw a monk behave like such a savage!" Then Wu Song got into it with the young lord and got the better of him. That man turned out to Kong Liang who later reconciled peacefully with Wu Song. This is the left-hand panel of a Suikoden diptych.